Sales are important for any organization. After all, if companies aren’t selling they are not generating revenue. Increasingly, enterprises are using AI in sales to improve their bottom lines. AI enabled tools are helping sales teams in a variety of ways. From analyzing prospects’ emotional states, to recommending best responses for sales agents, or improve cross- and up-sell opportunities. Additionally these tools help with speed the response time to inbound inquiries, improve the matching of sales reps with customers and provide better lead scoring. 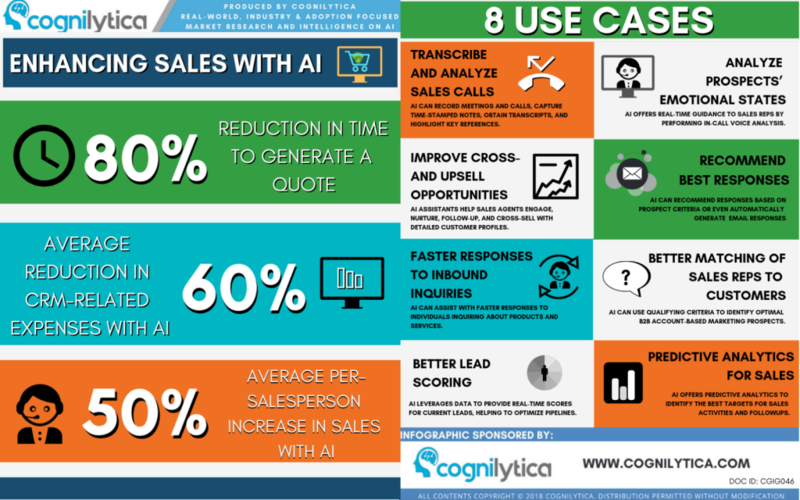 In this infographic from Cognilytica we explore 8 ways that AI is being used in sales.